Opel's Ampera-e will challenge established EVs from Renault and Nissan. PARIS -- Electric-car pioneers are facing a challenge from their peers as EV concepts dominate the Paris auto show. Volkswagen Group's diesel scandal and falling battery costs have persuaded executives and investors that battery-powered cars are ready to go mainstream. The flurry of unveilings signals a threat to pioneers of the current generation of EVs from automakers such as Tesla, Renault and Nissan, who will now have to work harder to defend their lead. VW is leading the charge, keen to turn a page after its exposure last year as a U.S. emissions test cheat. The carmaker is showcasing new electric vehicle architecture underpinning a June pledge to achieve annual sales of 2 million to 3 million electric cars by 2025. Nissan's 2010 Leaf kicked off the contemporary crop of battery-only cars, joined two years later by alliance partner Renault's Zoe hatchback. But scarce charging points, a driving range limited to around 160 km (100 miles) and cheap fossil fuel stifled mass-market demand. Renault-Nissan, whose CEO Carlos Ghosn had promised to deliver 1.5 million EVs by 2016, has logged barely 350,000 sales to date. The Leaf accounts for two-thirds of those, more than any other electric model. Tesla meanwhile stormed the premium market with its Model S, tallying about 130,000 sales since its launch the same year as the Zoe. Its success proved that consumers were prepared to pay $72,000 for an EV that can do 425 km (265 miles) on one charge. The Opel Ampera-e is due to arrive next spring, promising a range of 400 km (250 miles) on a single charge. 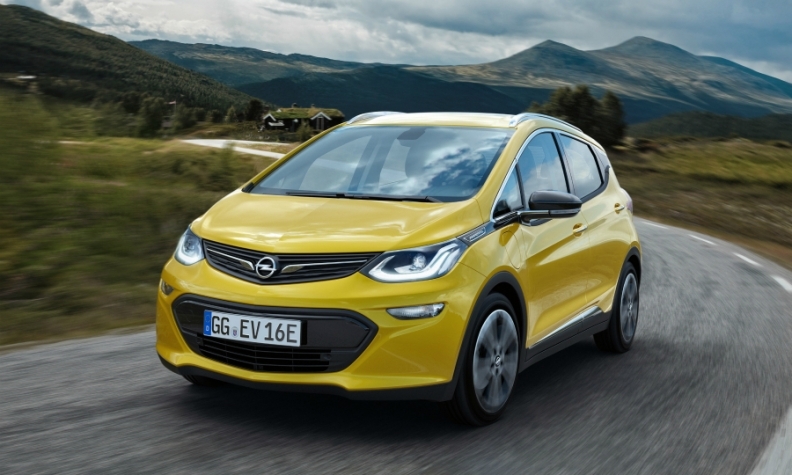 "Opel is democratizing the electric car with the Ampera-e," Opel CEO Karl-Thomas Neumann has said about the new model. Tesla had promised to do that with its promised Model 3, but the new vehicle will trail the Opel launch by at least a year, with a shorter expected range. The Ampera-e also travels further between charges than the entry-level Model S.
But affiliate Nissan, which builds its own batteries in a venture with NEC, will not be in a position to follow suit for another year, the sources said - leaving its flagship Leaf outgunned by the Ampera-e in the interim. Mercedes-Benz will show an electric car in Paris and outline plans for as many as nine production models, a source told Reuters recently, as part of a push by German luxury heavyweights to challenge Tesla. They are not the only executives taking a pass on Paris - where the outcry over the diesel scandal and weak emissions regulation has sharpened enthusiasm for electrified motoring. Ford and Volvo are also among the absentees. As if to underline growing hostility towards combustion engines in congestion-clogged cities, the French capital held its biggest ever "Car-Free Day" the Sunday before the show. Lawmakers voted the following day to pedestrianize the Seine's right bank, permanently closing a major traffic artery.